The aim of this book is to promote interaction between engineering, finance and insurance, as these three domains have many models and methods of solution in common for solving real-life problems. 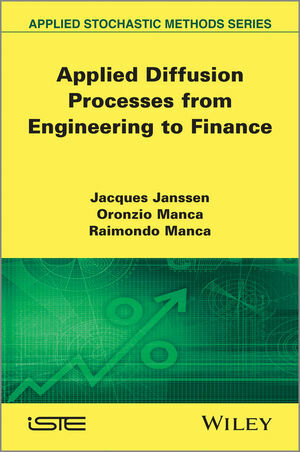 The authors point out the strict inter-relations that exist among the diffusion models used in engineering, finance and insurance. In each of the three fields, the basic diffusion models are presented and their strong similarities are discussed. Analytical, numerical and Monte Carlo simulation methods are explained with a view to applying them to obtain the solutions to the different problems presented in the book. Advanced topics such as nonlinear problems, Lévy processes and semi-Markov models in interactions with the diffusion models are discussed, as well as possible future interactions among engineering, finance and insurance. 1. Diffusion Phenomena and Models. 2. Probabilistic Models of Diffusion Processes. 3. Solving Partial Differential Equations of Second Order. 5. Basic PDE in Finance. 6. Exotic and American Options Pricing Theory. 7. Hitting Times for Diffusion Processes and Stochastic Models in Insurance. 9. Advanced Topics in Engineering: Nonlinear Models. 11. Advanced Topics in Insurance: Copula Models and VaR Techniques. 12. Advanced Topics in Finance: Semi-Markov Models. 13. Monte Carlo Semi-Markov Simulation Methods. Jacques Janssen is now Honorary Professor at the Solvay Business School (ULB) in Brussels, Belgium, having previously taught at EURIA (Euro-Institut d’Actuariat, University of West Brittany, Brest, France) and Télécom-Bretagne (Brest, France) as well as being a director of Jacan Insurance and Finance Services, a consultancy and training company. Oronzio Manca is Professor of thermal sciences at Seconda Università degli Studi di Napoli in Italy. He is currently Associate Editor of ASME Journal of Heat Transfer and Journal of Porous Media and a member of the editorial advisory boards for The Open Thermodynamics Journal, Advances in Mechanical Engineering, The Open Fuels & Energy Science Journal. Raimondo Manca is Professor of mathematical methods applied to economics, finance and actuarial science at University of Rome "La Sapienza" in Italy. He is associate editor for the journal Methodology and Computing in Applied Probability. His main research interests are multidimensional linear algebra, computational probability, application of stochastic processes to economics, finance and insurance and simulation models.